I’ve been dying to show you this since the very first time I tried it months ago. I simply couldn’t wait to help you make yourself look like a genius. And an elegant and sophisticated genius at that. Smoke and mirrors, kids. This gorgeous little snack can be put together in less than five minutes. 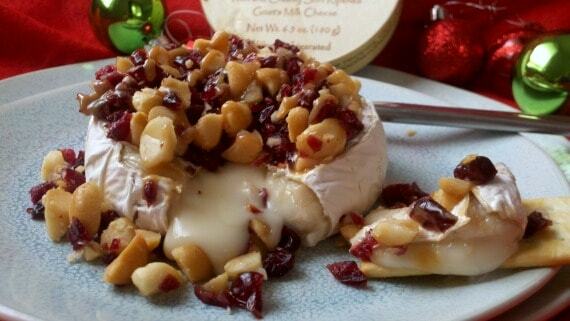 The holidays are the perfect excuse for indulging in a lovely gooey brie topped with macadamia nuts, dried cranberries, and caramel sauce. Yes, caramel sauce, like the kind you put on ice cream. It sounds weird, I know. That’s what I thought the first time I tried this, but it totally works. I always hear TV food celebrities talking about people stopping by at the holidays. I guess that’s a thing that happens to some people. If that happens to you, this would be the perfect thing to bring out because the other secret is that you don’t even have to turn on the oven for this. Stick your wheel of brie in the microwave for a minute or two, and it’s perfect. Pile all your goodies on top, surround the whole thing with some buttery crackers, and everybody will be so impressed they’ll think they somehow ended up at Ina’s house. You know I love cheese, and it’s one of the things I love to splurge on. 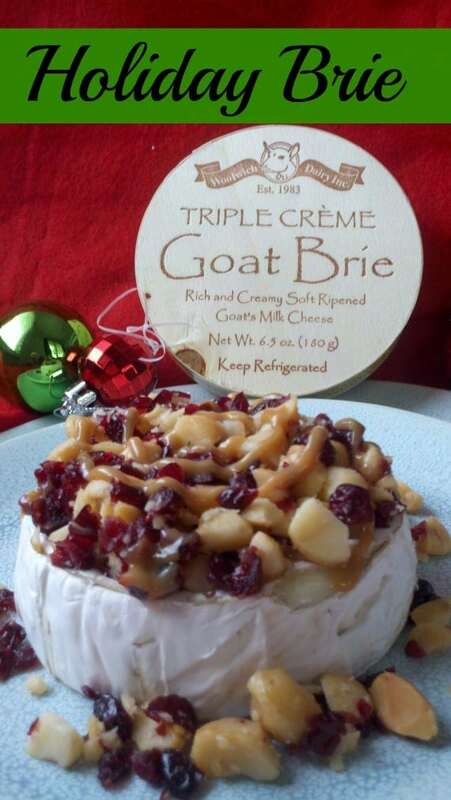 You can get a small wheel of brie for $6 to $8 at my grocery store, but if you have time to go to Costco, they have larger wheels of amazing triple cream brie for under $10. This “recipe” is much more assembly than cooking, so just adjust the amounts based on the size of your cheese. I hope you have surprise guests during this holiday season. I hope they show up with a bottle of wine, and I hope you get to stuff their faces with gooey cheese! A sweet and savoury gooey cheese ready in five minutes, perfect for emergency entertaining. Place dried cranberries in a small dish of hot water to soak for a few minutes. You can skip this step if you're in a big rush. 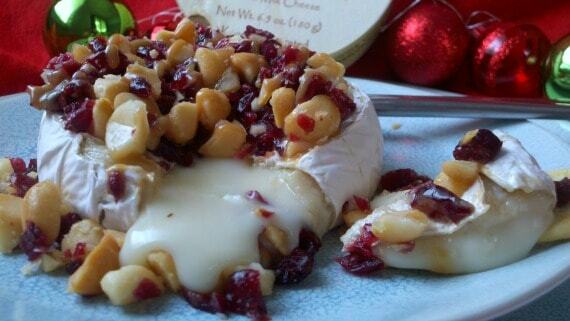 Place unwrapped brie in the center of a large plate and microwave on high for 1 minute. Give it a little poke in the center. If it feels soft and squishy, you're set. If not, continue to microwave for 30 second intervals until it's gooey all the way through. It shouldn't take very long. Drain the water from your dried cranberries and dump them on a cutting board. Add the mac nuts to the pile, and give everything a rough chop. How rough or fine is totally up to you. Drizzle some caramel sauce straight on to your brie. Pile your mac nuts and cranberries on top. It's totally fine if they artfully spill over. Give the top another drizzle of caramel sauce. Surround the whole mess with some buttery crackers, cut out a skinny wedge, pope it on a cracker, hand it to your favorite person, and witness the whole crowd swoon.